Oscar is 11 months old! Although we’ve had some challenges with Oscar over the past few months, life with him is pretty calm these days. The biggest breakthrough in Oscar’s behavior has been due to Move the Pig, and I am both surprised and pleased with how much Move the Pig has improved his behavior. Oscar’s aggression has a tendency to come and go from one month to the next, but right now he is showing almost no signs of aggression. After dealing with his persistent head swiping and air biting for several months, I am amazed that he hasn’t done either of those behaviors in quite a while. I have heard some people describe Move the Pig as magical, and so far I agree with that description. 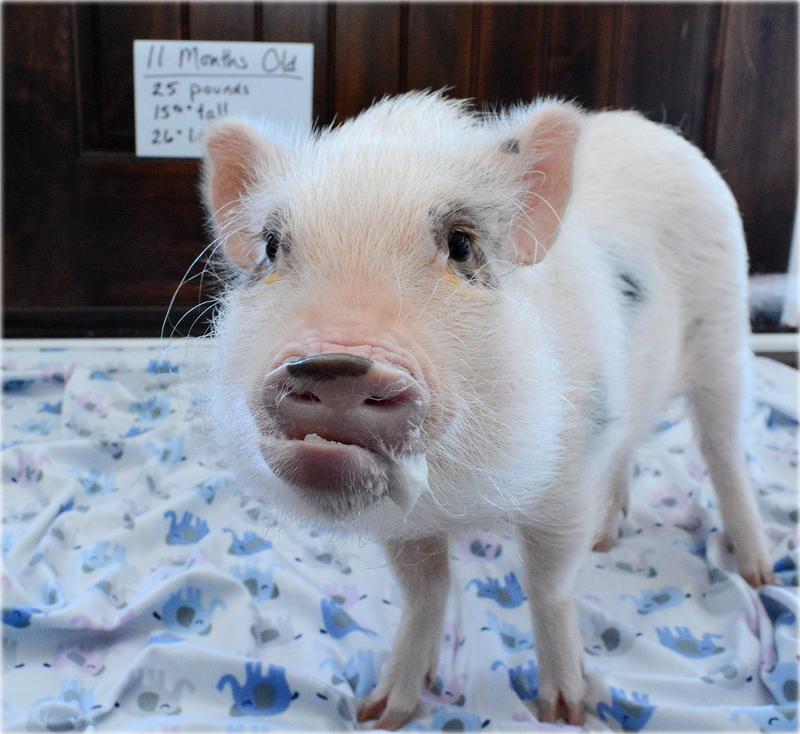 What amazes me is that Move the Pig doesn’t appear to deal with mini pig biting because it’s done at a different time than biting and doesn’t involve handling the snout or mouth area, but it still works. My favorite part of Move the Pig is that it’s done at random times of the day and doesn’t have to be done when your pig is being aggressive, allowing me to walk away from a tense situation and handle it later by moving Oscar. Things between Oscar and his dog sister, Rylee, have even improved. When we first started Move the Pig with Oscar, the relationship between Oscar and Rylee got worse initially. Although I’m not positive, my theory is that Oscar was fighting even harder for his spot in the hierarchy against Rylee since he was losing his battle with the humans in the house. Fighting with Rylee gave him hope of remaining higher in the hierarchy than at least something. However, over time, he just calmed down and stopped instigating battles with her. They still have occasional “checks” with each other, particularly around food, but it doesn’t escalate and Rylee seems back to her normal self and at ease in the house again. As I’ve learned with Oscar, shifts in his aggression can happen at any time, but for now things are calm and happy. Everyone seems to know their place in the hierarchy, and there isn’t a constant struggle going on for position. 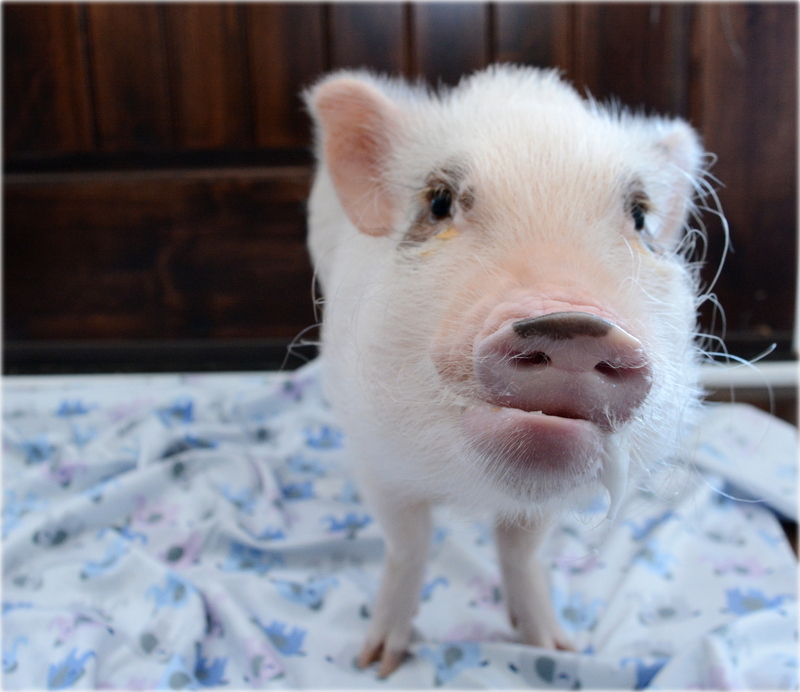 We still do Move the Pig a few times each day as maintenance, but I’m really happy with Oscar’s behavior these days. Our little guy had a small growth spurt this month due to me increasing his food just to make sure he was getting enough. He now gets a mid-day kale salad for extra nutrition, and he’s thrilled about the addition. At 11 months old, Oscar is 25 pounds, 15.5″ tall, and 26″ long. Keep it up Oscar! You are too cute! 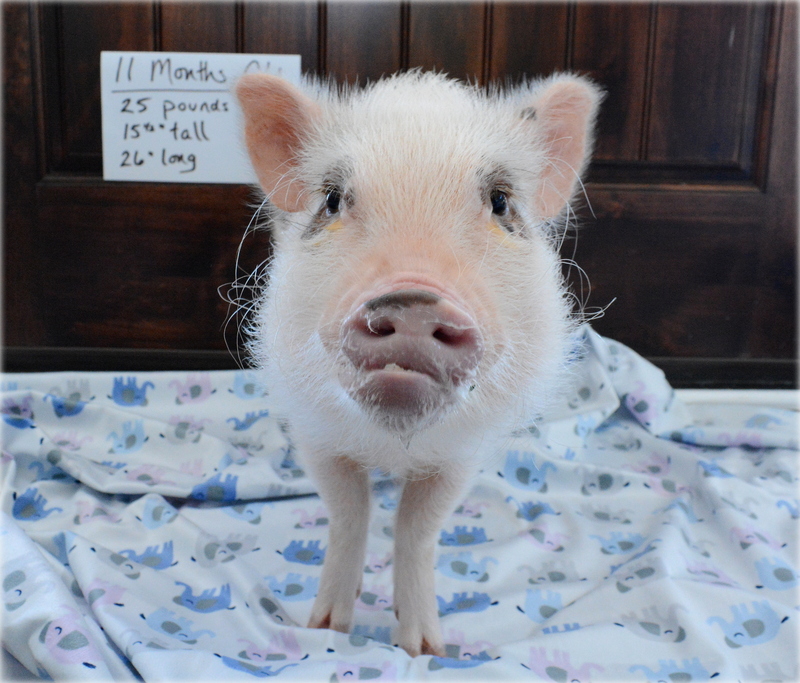 It seems like Oscar is going to remain a relatively small pig based on his measurements at almost a year old. What do you think? What did the breeder say? Elmer was about 50 lbs. at a year old. He’s 2 now and around 80 lbs. and his growth has really slowed. I’m actually surprised at how small Oscar is so far. The reason I increased his food this past month was just to make sure we weren’t accidentally underfeeding him, but he seems to be getting plenty. 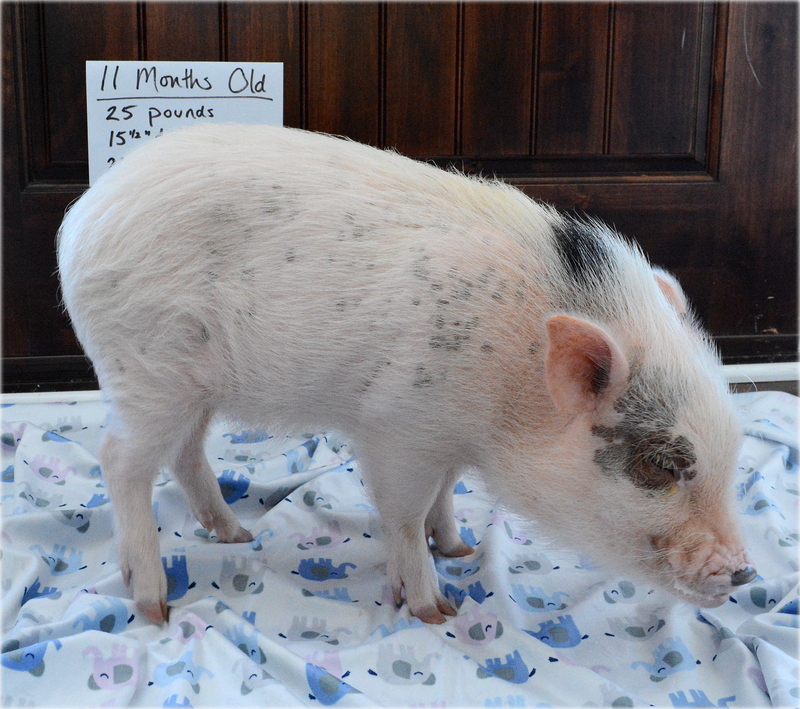 The breeder doesn’t give specific weight estimates (although I think I read 20-40 lbs on their site once), but based on my research of them and other pigs from there, my guess was that Oscar would be at least 40-60 lbs full grown. He still has plenty of growing to do though of course. Part of me still wouldn’t be surprised at all if he’s Elmer’s size by the time he’s done growing, but I just have no clue. I think back to when I started the “Watch Oscar Grow” section, and I had no idea how big he would end up getting. 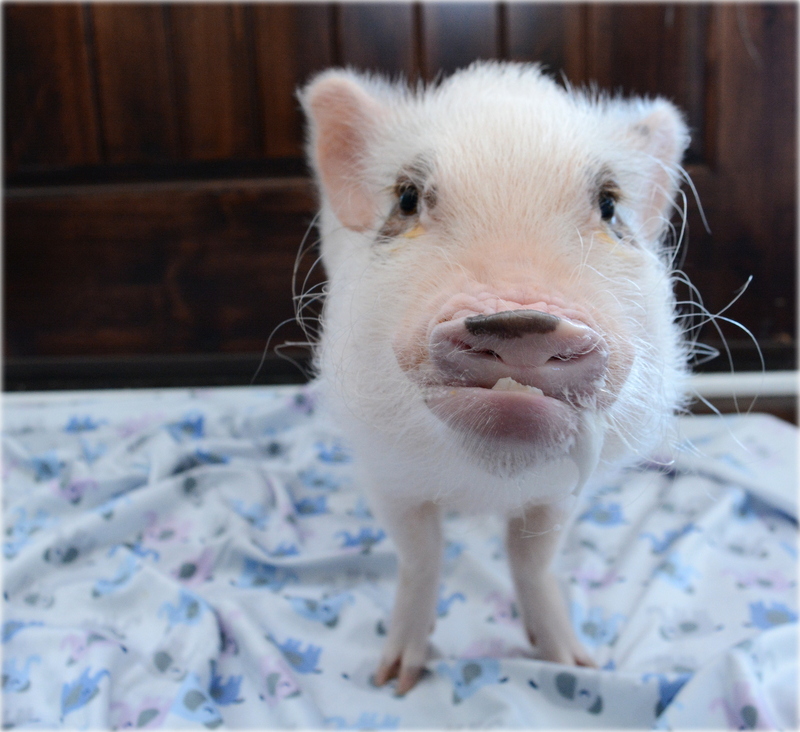 Part of me feels a little self conscious because Oscar is smaller than I expected, and I’m worried people will think he’s an example of how small all mini pigs are. 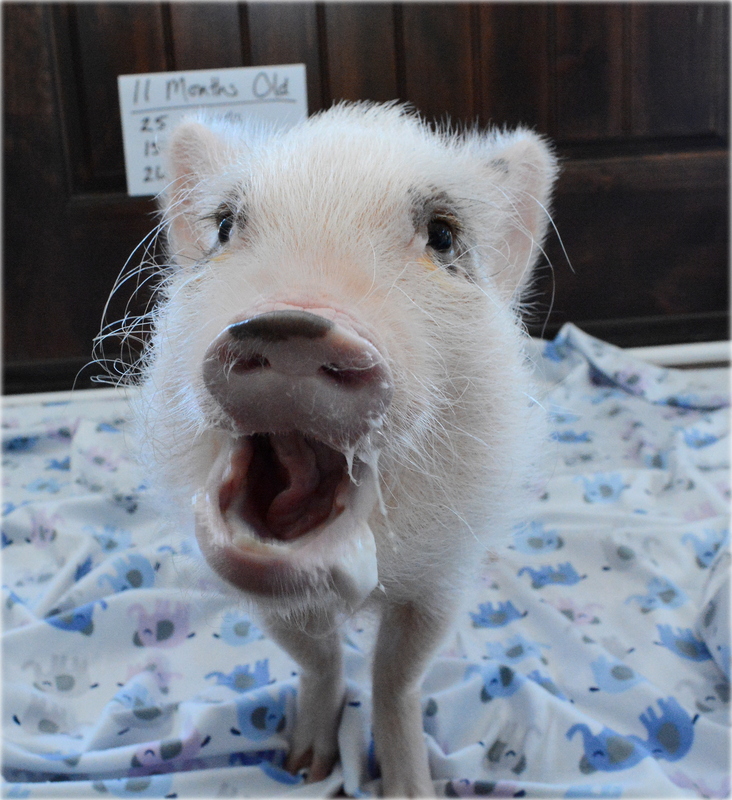 Elmer’s size is much more common for most mini pigs, and Oscar could still get there (who knows!). Although I’ve heard pigs don’t stop growing till 3 years of age, I still don’t consider Elmer that big compared to other pigs I’ve seen on YouTube and I don’t think he will be more than 100 lbs, but I could be wrong. He’s not overweight and not a potbellied pig. I think Oscar will probably be the size of Hamlet on YouTube. At 5 years old, he’s a fairly small pig.